The current economy isn't much fun. With the official unemployment rate over 9% and the true unemployment rate possibly double that, it's hard to feel confident when you set out to find a new job. Unfortunately, lack of confidence could be the very thing that prevents you from landing the job you want. It's human nature to want to associate with – and hire – people who are upbeat and positive. No one wants to be around others who are down in the dumps. We might feel sorry for them, but we still want to get away. So – in order to find employment, you need a positive attitude. You need to walk into an interview feeling confident that YOU are the best person for the job. Then you need to convey that confidence to the employer. If you're thinking "They have 200 applicants, why should they choose me?" then they probably won't choose you. Unemployment can cause a host of negative emotions, all of which work against you as you try to find new (or better) employment. Which Bach Flower Essences can help you re-adjust your attitude? Agrimony helps release anxiety. And worry over your income is definitely anxiety! Centaury will help you overcome the feeling that you're inferior to other job applicants. Gentian helps restore your confidence in yourself. Gorse gives strength to hope for the best. Larch dispels feelings of low self-worth. Mimulus will help you overcome the natural fear of going to that interview. Pine helps relieve the guilt you feel for being out of work. Willow will help dispel the feelings of bitterness and self-pity that can stem from this current economy. Which of these emotions is holding you back? If you're not sure, visit FeelBach! and take our questionnaire. It will help you choose the Bach Flower Essences that will help you succeed. Are you denying yourself the pleasure of living so that you can live up to self-imposed standards of living? Do you impose rigid practices that you feel can NOT be broken? For instance, getting up early every morning to run, then heading for the gym before sitting down to a prescribed meal? Do you deny yourself good tasting food and drink because it doesn't fit your idea of what is "good and right?" And then, do you set mandatory standards on so many hours a day of meditation or prayer? If so, you're probably frustrated by the demands of daily life, and probably castigating yourself for not being able to measure up. Your self-reproach far outweighs the benefit you might have gotten from hour hours of meditation. If this is you, you're in a negative Rock Water state, and you've cut yourself off from your Higher Self. You've stunted your own spiritual growth. Although grouped with the Bach Flower Essences, the answer to your situation is not actually a flower essence. It is Rock Water - water taken from natural springs in areas untouched by civilization. These waters are exposed to the sun, the wind, the vegetation, and the native animal life that surrounds them. 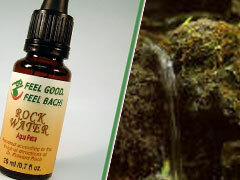 To learn more about Rock Water and how it can free you to enjoy life, visit www.bachflower.org. And if you're not sure that this is the correct Bach Flower Remedy for you, visit www.feelbach.com and take our questionnaire.